While we’re going at it with the androgyny trend, isn’t there something to be said about cufflinks? 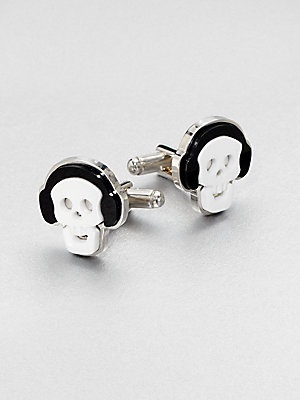 I love this Prada number above with white ceramic skulls wearing big beats headphones. So tongue-in-cheek and monochromically stylish retailing at £195 at Selfridges the last time I checked. But women’s shirts rarely have the french cuff appropriate for such accessorizing and I wonder if designers should rethink this. 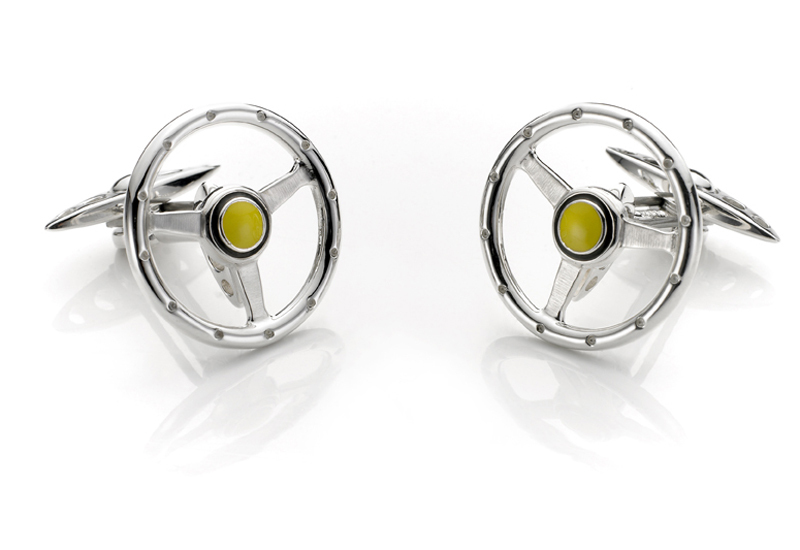 I, for one would love a pair of these Ferrari inspired jewels (below) with the lemon yellow centre of a steering wheel to spruce up a white silk blouse or sharpen a denim shirt. There’s a shiny gap in the Accessories market that designers could tap into here. All I’ve found so far is Cuffwear who have designed a prototype model of magnetic cufflinks to attach to any cuff for the syle-conscious man or woman. This is exciting stuff and they’re seeking funding for mass production through our favourite crowd-funding site kickstarter.com. But the trouble is I don’t love their designs so far. Founder and inventor Marcus Duffin is interested in partnering with potential buyers to custom-make a design of your choice. 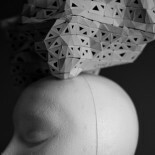 Might be worth getting involved if you’re a budding accessories designer? This entry was posted on September 8, 2013 by stYlobAte in fasHioN, STYLOBATE PICKS and tagged accessories, Beats, cufflinks, Etsy, Fashion, Ferrari, Karl Lagerfeld, Monster, Skull, Style, Stylobate, trend, trends.